I grew up in Paris into a family of architects; immersed in floor plans and section plans drawn on tracing paper and sketch models since my early years. My father would explain things to me with little sketches and arrows on napkins (the word ‘map’ in fact comes from the Ancient Greek word for napkin!) and tablecloths in cafes. At the time I knew nothing else than buildings, heard numerous arguments in cafes and at home about the city, the modernist approach and the vernacular one, the idea of the cell, the separation between living and working, these kinds of things. During my architecture studies I spent my idle time visiting Le Corbusier’s architecture. I also worked as a resident guide in the Convent of La Tourette, in a Modulor- room design. My professional practice in the architecture offices was not creative at all – it was mostly about tracing the projects of others, changing the scales and rendering façade with colour pencils. ‘As described by Deleuze and Guattari in A Thousand Plateaux, tracing is a process of graphic translation. Tracing operates through blind repetition, through a process of constant skipping back onto the outline of the object it traces…’  A tracing can be cartography that delimitates and simplifies. It is often the world as seen from above, a structure which supervenes on life’s complexities. A map has generally been seen as a code, something that is ‘to scale’. But this has not always been what people are doing when they are making maps, as we shall see. Deleuze and Guattari see mapping as the opposite of tracing- tracing copies and mapping creates and expands. 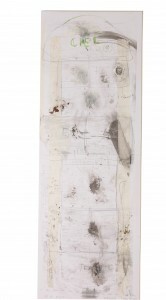 ‘The diagram is a duality composed of tracing and mapping. Deleuze and Guattari concede that tracing and mapping must be superimposed to form a process of simultaneous constraint and expansion.’ The work that I am making uses aspects of tracing, but always complicates this schema by making things to be personal, by combining and juxtaposing perspectives, by having no fixed scale or language. 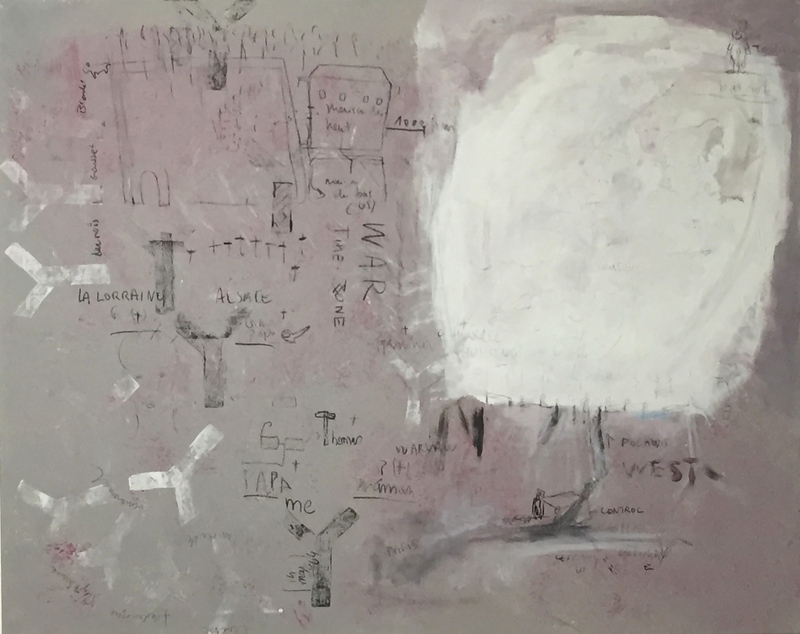 Other artists also take the idea of the tracing and broaden it, such as Gianfranco Baruchello and Antoni Tàpies, two artists very important to the development of my work. On My Mother’s Side is a large piece which embodies a genealogical tree. It is at certain points a classical family tree. But it includes other languages of signs, and other perspectives interrupt the linear diagram. On the right there is a great white void where the bulk of my mother’s family lie, with their histories unknown and the evidence lost. The work is made using a kind of stamp that I produced prior to making the work, a linoleum ‘Y’ shape which leaves its imprint and creates a dichotomy. At each branching, the connection acquires vitality – or loses it, either way there is a transformation. I used different primers to create a surface that would look homogenous from a distance but rich and porous from near. I did not wanted to paint a surface but to create one, which is a different thing.The Y is a formal device, or perhaps I might call it a formal principle around which the work is structured. Using one formal principle, or tracing structure, one can create infinite numbers of difference in the creative ‘mapping’ process. It is the same as in architecture, where the Y would be a generalised formal device to be customised according to the individual circumstances. I approached the painting as a tree (Deleuze’s ‘tree logic’) in which ready-made dichotomies are stamped to create an infinite structure, creating a ‘fractal’ logicwhich leads from the tree to the rhizome. I wanted to think about how to approach the infinite within the painting’s surface. The branching dichotomies are interrupted by my own stories and those of my ancestors, mixed up and retold and drawn by successive children, perhaps. These have their own logic and their own sense of up and down. This heterogeneity creates a rhizomatic element. T like Thomas – A desire of assemblage. The T in this work stands for the architect’s tool, but also for Thomas, my father’s surname. The T device here stands as a symbol of the architect, as a visual ratio which divides space and for the passage between a vertical and a horizontal state, as in the movement from seeing the painting on the floor and on the wall. 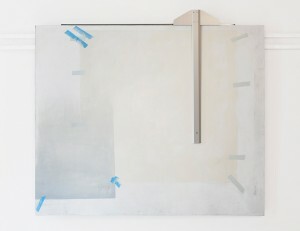 The painting assembles elements that navigate between the abstract and the concrete. 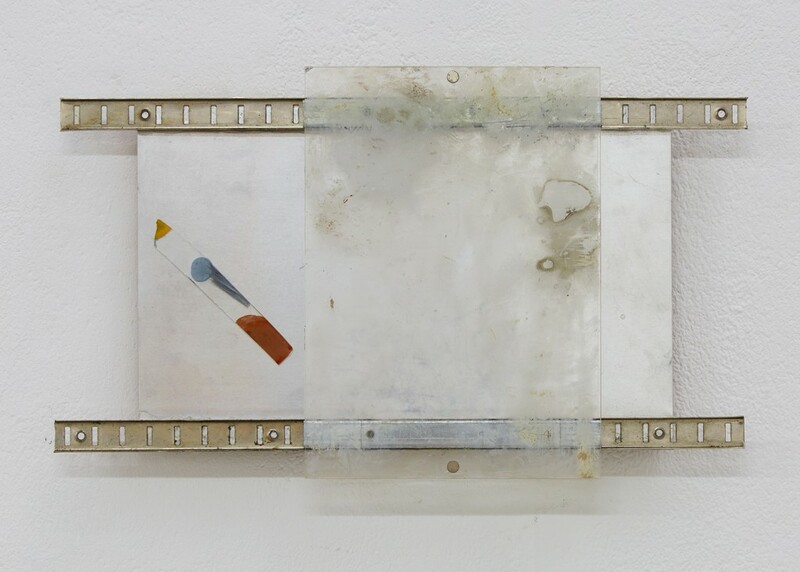 The configuration and superimposition of the painted surface seem to follow a system that is abstract, and reflective only of itself.It looks to the viewer as if there are three semi-transparent layers held there by pieces of tape ‘to keep things in place’. The readymade, juxtaposed with the painted surface, brings something that belongs to the outside world, so it refuses to speak only one material language. The painting’s support is a metaphor for the architectural drawing table. In fact it is a little more than a metaphor- it is a diagram that is also an object. So it is a painting and also a drawing table. What the work communicates: it tells the viewer to move the T, draw a line, I am inviting you to participate, the author has gone, you see. When I say that the author is gone, I mean that while making the work the ‘play session’ stopped; I made a decision to absent myself, not to impose my floor plan on these layers of absence. It is more about the desire to draw and the end of that desire- the line of desire paused at some point to leave a space for the viewers (including me) and carried on in the painting after this one; it became an open circle of ‘becoming’. The mood with which I have tried to achieve this piece was very close to acting ‘as if for real’. I was setting up my paper and tracing paper on a table to eventually draw a floor plan, create an image. The movement between the floor plan and the wall-bound painting is always interesting for me. All my surfaces are walls but also grounds – we live in between horizontal and vertical planes (the walls of our houses, the walls on the streets, the streets in the town, the virtual walls of our frontiers) and the space we actually live in relates in one way or another to these two positions.